Affective disturbances are highly prevalent in non-affective psychosis and exert significant impact upon its course and outcome. Low mood and associated suicidality, anxiety symptoms, withdrawal and isolation have been consistently observed throughout the course of psychosis, during the prodromal phase and following symptomatic recovery. Social anxiety disorder in particular is among the most prevailing disturbances manifest in people with psychosis. Prevalence rates range between 17 and 36% in people with psychosis. The nature and phenomenology of social anxiety in psychosis are not well understood and the need to identify the developmental and psychological origins is of fundamental importance. 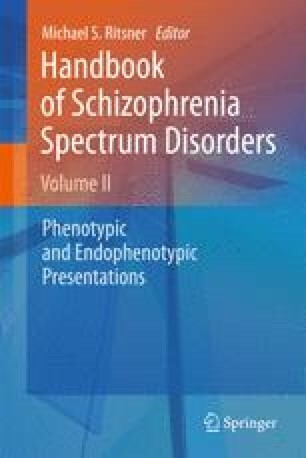 In this chapter we will thoroughly examine the phenomenology of social anxiety in first-episode psychosis and we will also investigate its relationship with positive symptoms and particularly paranoia Understanding the pathways and psychological processes that lead to the development of affective dysfunction in psychosis will have important implications for psychological interventions and treatments.